You need following components in order to make this project. This post will help you to setup RaspberryPi with an operating system and required hardware. Install overgrive and configure it by following instructions given here. Connect camera to a USB port of RaspberryPi and install fswebcam application to RaspberryPi with this command. Open terminal and run following command. Check if camera is working. Run the following command and check if camera is taking picture or not. If camera is working you will not get any error and an image named image1.jpg will be created in current directory. Open image1.jpg and if you see an image the camera is working perfectly and you can go ahead. Connect ground port of the pin to ground pin of Raspberry Pi and other port of the button to Pin 18 (physical pin 12). Run this program with the following command in terminal. if all components are properly connected and the program is error free then the camera will take the photo on every button press. I believe that you will successfully make this project. You should have basic knowledge of Linux operating system and Python programming language. Still, if you face any problem ask in the comment box. All you need to learn how to use camera module with Raspberry Pi. Everything else will remain same. At present we don’t have video for camera module but you can search on the internet, you will find many. hi, i want to ask, if i change the camera with 5mp camera module raspberry pi, is it possible for me to use the same code? 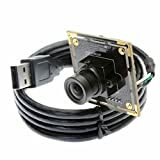 is the source code is still same if i use camera module raspberry pi instead of using usb camera?